I’m pretty eco-conscious, shunning excessive or unnecessary trash wherever possible. Even when RancherMan & I go out to eat, I bring a small lidded glass dish into the restaurant with me to hold my leftovers. That keeps me from having to accept their Styrofoam packaging. But one of my self-imposed rules about my crunchiness is that I want to make it ‘un-weird‘ in public to keep RancherMan from feeling uncomfortable. He assures me my eco ways don’t make him uncomfortable, but I still want to be considerate. And let’s face it, carrying a small casserole dish through a restaurant does not blend in with the atmosphere. So I decided I needed a carrier that looked almost purse-like. At first I thought perhaps an actual small purse might fit the bill. Although I don’t typically carry a purse, maybe I could find one the right size to hold my glass dish. But I couldn’t find anything that worked. So I kept looking. Y’all know I love all things denim. I’ve used RancherMan’s old worn-out jeans to make various things from rustic Pocket Coasters and custom Corn-Hole Bags for our game. I use them to make cute Denim Baskets and fun Pocket Warmers. Y’all know if it’s denim, I love it. 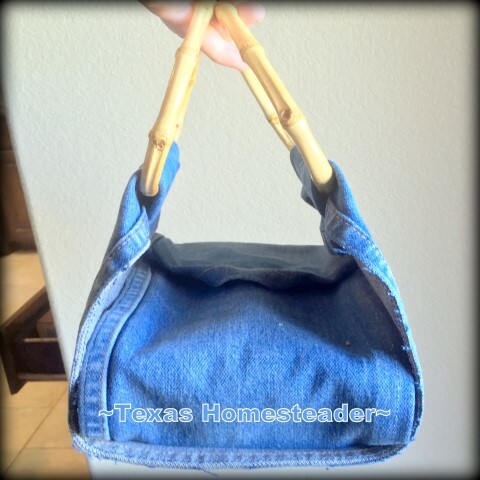 Why not make a casserole carrier out of denim?? Now remember y’all, I’m not a seamstress. (BOY, is that an understatement!) And I didn’t have a pattern to go by. But I don’t think you really need one. It was easy enough even for me! Basically I’m going to cut two strips of denim, criss-cross them and sew them together. The denim fabric used should be cut from the back leg section of an old pair of jeans because the fabric on the back of the leg is going to be less worn than the front side. I’ll use snaps on the strip used to wrap around the casserole dish to hold it securely. I’ll attach handles on the other strip to carry it. The beauty is this: Whatever moderately-sized *Lidded Casserole Dish you have, you can make this carrier to fit it. To make the dish easy to carry you don’t want a dish that’s too large of course. And having a lid for your dish is important, because you’re carrying food ya know! 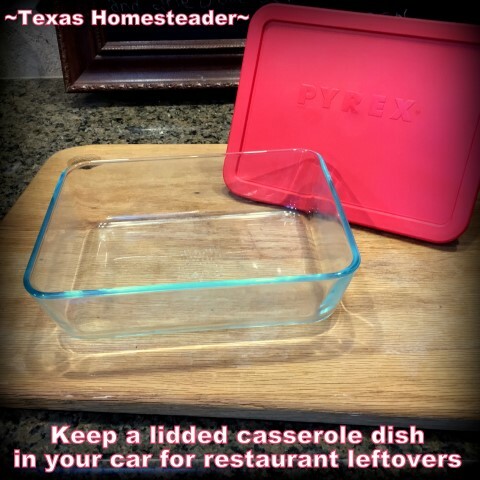 A rectangular-shaped dish (as opposed to a round dish) stays most secure from sliding around inside the carrier. I started off measuring my approximately 5″x8″ *Glass Pyrex Dish to find out how long the strip that wraps around the long end needed to be. I made that strip long enough to wrap around the long side of the dish and then overlap on top. To mark the fabric to the desired length I used chalk. I knew it would simply brush away clean when I was through. Now that the wrap-around strip is cut & hemmed it’s time to make the strip that will hold the handles. So once again I measured to see how long the strip needed to be for my Pyrex container. 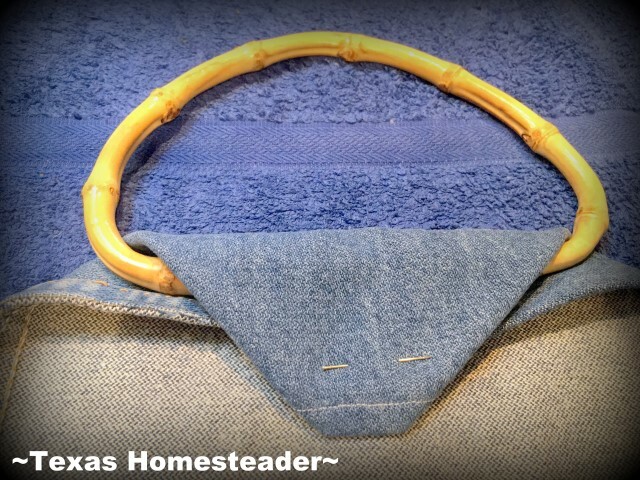 I took into consideration that the handles would need some denim wrapped around them to attach them to the carrier. Then I cut/hemmed that strip too. 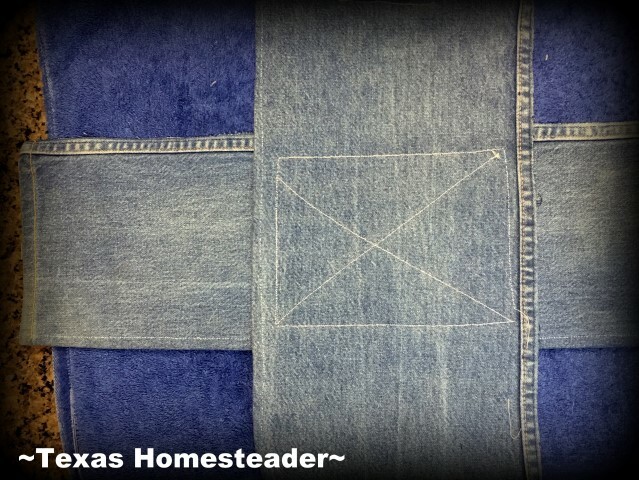 To join the two strips I criss-crossed the two pieces and sewed around the perimeter of the joint. I sewed across each direction as well. The photo below shows the bottom side of my carrier. Now I figure if you wanted quilting here for insulation you could certainly add it between the two denim pieces before sewing them together. But I just wanted the actual denim. I’d already purchased the *Bamboo Handles that I wanted to use for my carrier. So to attach the handles I folded the ends of the handle strip into a ‘V’ and folded it down over the handle. I pinned it down and then sewed it into place. You could, I suppose, put a snap here instead of sewing the fabric to hold the handle. Although that would make the handles removable and make for easier laundering, I was concerned about the stability since this carrier will be holding a glass dish filled with food. I’d rather spot-clean when necessary and make these handles permanently attached. Now we’re almost done! To keep the casserole dish from sliding out of my carrier, I needed a way to secure the strip that wraps around the dish. I bought *Snap Pliers And Metal Snaps for this section. I put one part of the snap on the very edge of the wrap-around strip. Then I measured to find out where the receiving section of the snap would need to be installed. Once both sides were installed I tested to make sure it was snug. PERFECT! But what if I have a slightly larger casserole dish that was too big to allow this strip to be securely fastened? So I decided to add another receiving snap section further down. Now my cute carrier will fit more sizes than this one glass dish should it ever be necessary. Gotta love flexibility! I had planned on folding down each corner of this snap section and sewing it down just because I liked the look. But in the end I decided it wasn’t necessary. Less sewing for me? Yes please! So I took a couple of large black coat buttons from my grandmother’s collection of vintage buttons and sewed one to either side of my carrier just below where the handles were attached. I used a heavy hair elastic for a flexible closure. 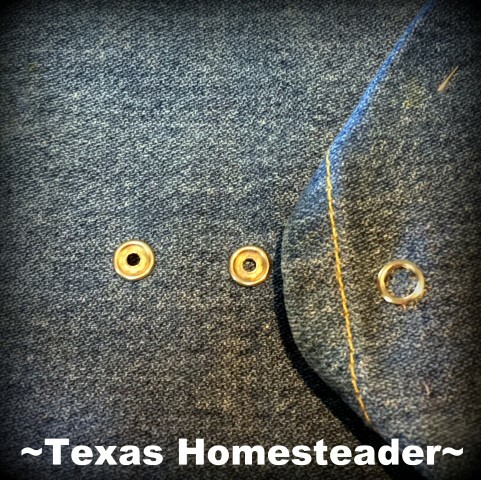 To make the elastic stay put I wrapped it around one button and used black thread to tack it. Now to close my carrier I simply stretch the elastic across to the button on the other side and loop it over. NICE! I love my new denim casserole carrier. Now I can walk through a crowded restaurant and not feel out of place carrying my own zero-waste take-out container. Good for me, good for the environment and a nice addition to my No-Waste Dining Experience. Plus since I used heavy repurposed denim it was cheap, cheap, CHEAP. #UseWhatchaGot, y’all! After our restaurant meal this glass dish holding my leftovers will go straight into the fridge when I get home. When it’s time to enjoy my restaurant leftovers I can heat & eat right in the same glass dish. So there’s no additional serving dish to wash, and nothing to throw away. When it’s empty I’ll wash the dish, place it back in my carrier and put it all in the back seat of our car. It’ll be ready & waiting even if we make an unscheduled stop at a restaurant. Now you more experienced seamstresses out there can probably do a more polished job I’m sure. But for me it’s perfect! 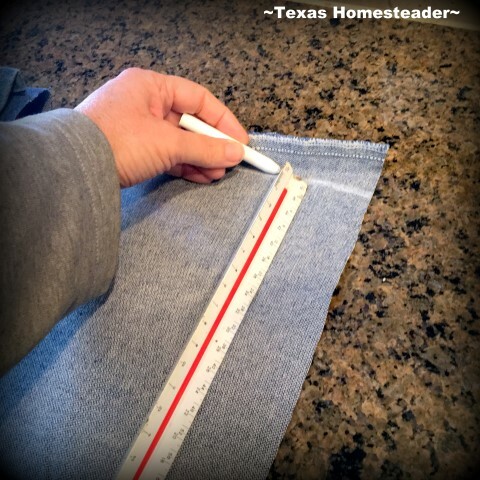 This entry was posted in Blog Posts and tagged crafts, Frugality, Make-It-Yourself on March 24, 2019 by Texas Homesteader. Love it and can’t wait to make one. Since my husband and I don’t eat as much as we used to there is always some to take home unless we eat breakfast out.